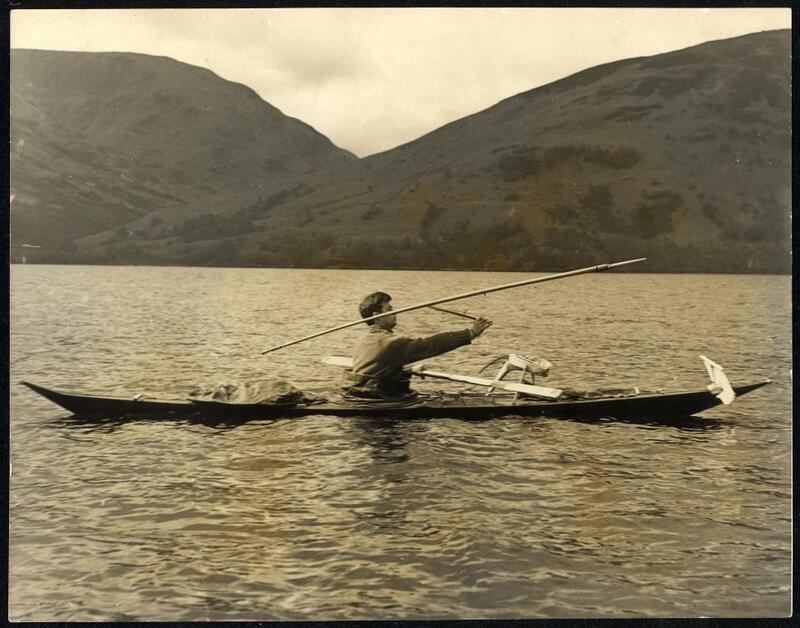 Before I went there in 1959 I had only seen that one other Greenland kayak, in the Hunterian Museum at Glasgow University. So I really had no idea how many different kayak designs the Inuit of Greenland had ever actually come up with. In the years following I did see a few museum specimens that were not identical to the ones I’d seen for myself in Greenland and I did read about others in, for example, Adney and Chapelle’s The Bark Canoes and Skin Boats of North America (1964). But it wasn’t until Golden’s Kayaks of Greenland [KoG] came out in 2006 that I realized just how much variation there used to be. In other words, that the kayaks I knew from the Uummannaq Bay area were examples of just one among several different Greenland Inuit kayak designs. At all the villages I stayed in or visited, also at the Umiamako hunting camp, and in Uummannaq town, all the kayaks I saw and in many cases measured did have the same distinctive design. They all had the noticeable simple, positive sheer to the gunwales, the very low fore deck, and the slightly upturned stern. There was one way in which some of them were significantly different from all the others, as I spell out below [this had to do with their cross-sectional shape], but the basic design was the same wherever I went. In his KoG, Harvey Golden describes and analyses 13 distinct types of Greenland kayak design, spanning the 400 year period, 1600 to 2000, with beautiful scale drawings of the 104 kayaks he describes. The Uummannaq Bay kayaks that I saw in 1959 were examples of his Type VI. All West Greenland kayaks are built with a special fore deck beam, immediately in front of the cockpit, known as the masik. 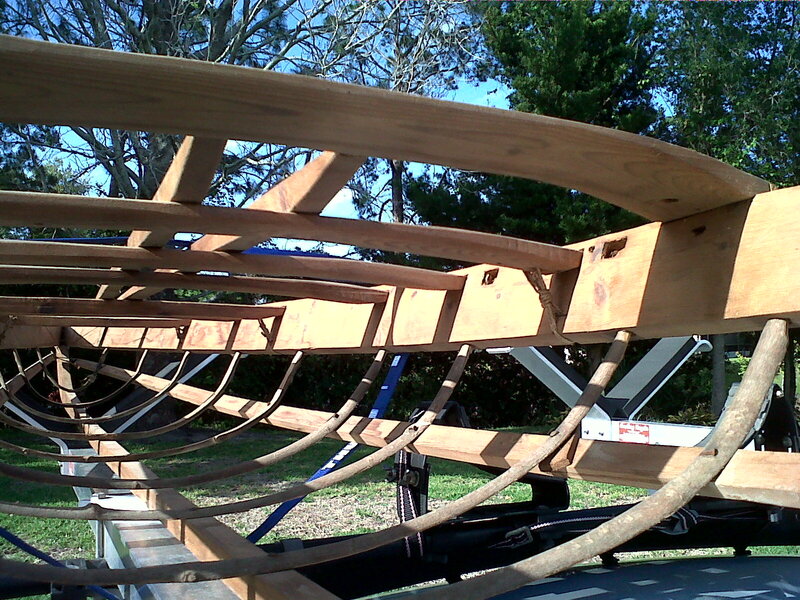 Of all the spars which span from gunwale to gunwale it’s the strongest, the most firmly attached, the most securely held in place by the (seal) skin of the kayak. It is always curved and its rise above the level of the upper surface of the gunwales is what determines the height and slope of the fore deck. The front edge of the coaming rests on the masik and this tilts the angle of the coaming and makes squeezing in and out of the kayak possible. In the Uummannaq Bay kayaks the masik has a distinctive shape. The ends of the masik are cut to be half an inch or so higher than the upper edge of the gunwales. The result is a distinct “bulge” in the skinned surface of the fore deck. Golden, in KoG (page 67), speaks of this as a known West Greenland option. Besides John Heath’s kayak, seven of the 81 west coast kayaks Golden describes have this kind of masik. Two of these are from Disko Bay, one is from Nuuk, and one from Upernavik. For the other three there is no information on where they are from. One way in which the Greenland kayak designs varied from place to place had to do with the curvature of their gunwales. 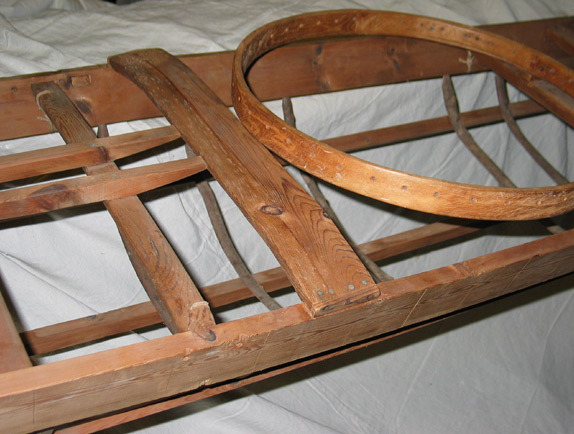 [The gunwales are the longitudinal boards that form the edge between the deck and the sides of a kayak.] 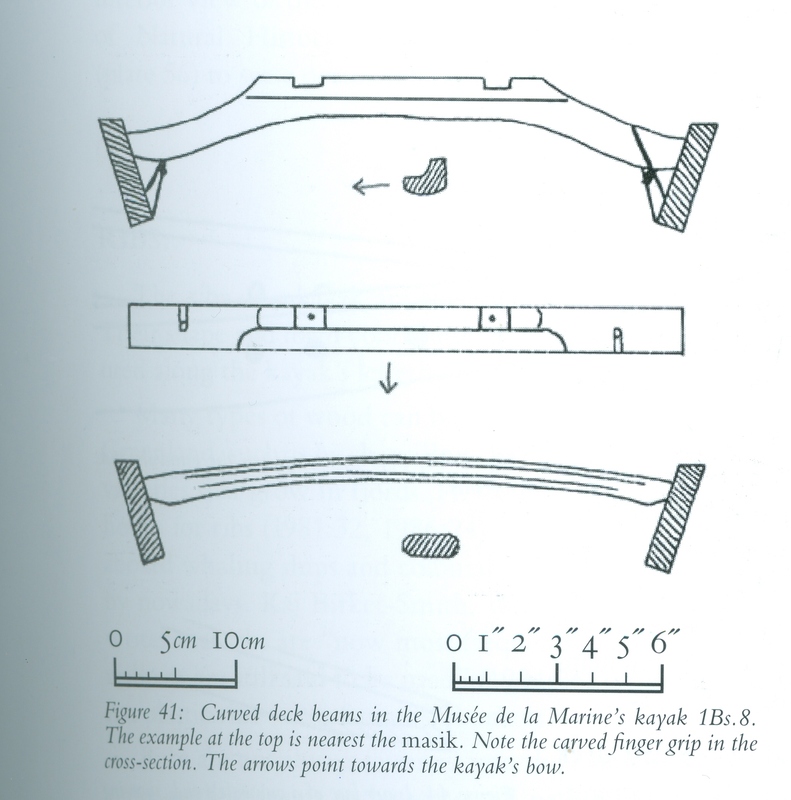 Petersen describes two ways of shaping the gunwale strakes. One involves adjustments in the vertical depth of these strakes, by cutting away portions of the wood and/or adding to the depth of the wood as shown in the sketch below. Figure 30 on page 54 of KoG. This shows the more complicated option. In the other more simple treatment of the gunwales these are two identical pieces of wood, the same depth and thickness for their entire lengths (i.e. not shaped in any way), attached to each other at bow and stern and spread apart in the middle to give the desired width to the kayak. 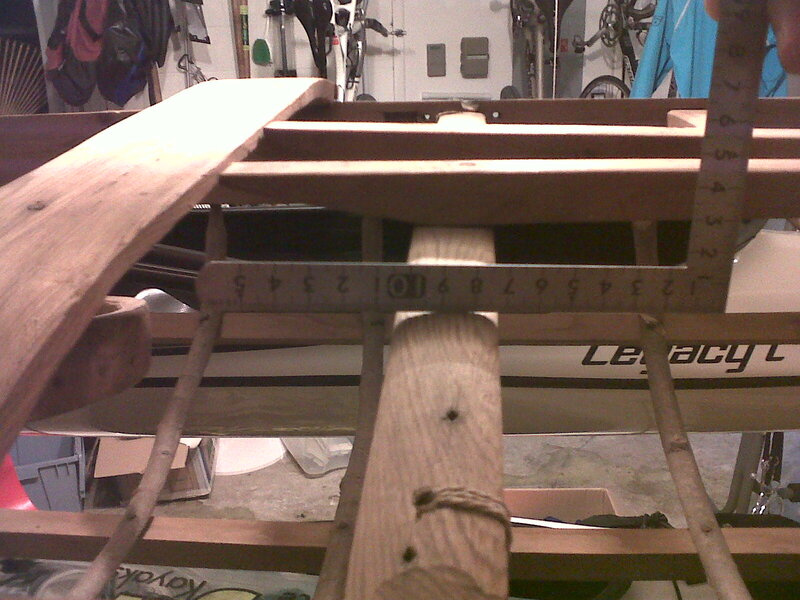 As you know if you’ve ever had the pleasure of building a skin-on-frame kayak (or anything similar) if you then lean these gunwale boards outwards to give them a “flare” of, say, 15 degrees off the vertical, the result is that the bow and stern will both rise above the level of the mid point. Seen from the side, this by itself will give you a sweet, continuous “sheer line” curve from bow to stern without any further effort on your part. Solid geometry will have done the job for you. And this is how the Uummannaq Bay kayaks, in all the places where I saw them, were built in 1959. Tobias posing with his harpoon during the hunting trip to Umiamako and me showing the use of the harpoon at Loch Lomond in the spring of 1960. These two photos show very nicely the curvature of the sheer line in Uummannaq Bay kayaks of 1959. This is a West Greenland kayak from somewhere between the years 1600 and 1800. Unfortunately, there is no information on where exactly on the west coast it was made. It is housed in the Rijksmuseum voor Volkenkunde in Leiden, the Netherlands. Quite unlike the Uummannaq Bay kayaks you can clearly see in the drawing that this kayak has what is known as “reverse sheer.” In other words, the gunwales are higher above the waterline in the middle of the kayak and lower at both bow and stern. Kayak designs also varied in the profiles of bow and stern. This photo of Johan Zeeb’s kayak, at Illorsuit, shows the gradually rising shape of the bow with its lower edge a convex curve, that was characteristic of the Uummannaq Bay kayaks in 1959. Also (tho’ a bit obscured by what looks like it may be his harpoon for some reason way out of its normal position) the moderately abrupt rise (rake) of the stern piece, with its lower edge also a convex curve. A close up of the kayak built for me shows this raking stern design. The photo was taken in August of 2012 at the Kelvingrove Museum. The angle of this raking stern is 17 degrees above the horizontal in my kayak and 14.5 degrees in the one made for John Heath. Approximately that much of an angle, as you can see in so many of my photos, was characteristic of the 1959 Uummannaq Bay design. In the Upernavik District, just north of Uummannaq, the kayaks used to have their sterns turned up at a much steeper angle. As Porsild says, “almost forming a right angle with the deck” (1915, page 121). Several of the Illorsuit kayaks (lined up for the race in the village bay, see Chapter Ten) showing these characteristic bow and stern shapes. Note that the kayak farthest from the camera, Ludwig’s, had its stern piece broken off by the early winter sea ice of the previous year. And an absolutely “classic” 1959 Uummannaq Bay kayak up on its qainivik in Uummannaq town. This is a kayak from Nanortalik near the southern tip of Greenland, dating from 1928. Golden describes it as being “rather extreme in form, its ends being very long and narrow. It has a remarkable fore and aft symmetry … the bow being nearly identical to the stern in profile and plan.” He also refers to its “[long] and concave ends …” (2006, page 377). Another feature of west coast kayak design which Petersen discusses in detail has to do with the fore deck beam immediately in front of the masik, called the seeqqortarfik. He describes it as having a quite complex shape so as to curve upwards one or one and a half inches “to give more room for the legs” (2001, page 21). This shows a seeqqortarfik, as described by Petersen. This example has an especially curved and complex shape. It is of a kayak from Kangaamiut in the Musee de la Marine, Paris. Also shown is the second deck beam, curved but with a simple shape. With the exception of only two specimens (#5 and #73), all of the 81 West Greenland kayaks in KoG do have curved fore deck beams — though only 7 of them with the complex shape described by Petersen. These seven are all from the southwest coast. More simply curved beams are recorded for the other 72 kayaks – some with a lot of curvature, some with very little. The Uummannaq Bay kayaks had very slightly curved fore deck beams, usually with a rounded and slightly arched lower surface. This recent photo by Stamer of Heath’s kayak shows the masik and the only slightly curved fore deck beams in front of it. Looking along the length of the fore deck beam immediately in front of the masik. This shows the slightly rounded upper surface of that deck beam; how it sits quite a bit lower than the bottom surface of the masik; and how the fore deck stringers are supported by the deck beams but do not touch the masik. This last detail is because “otherwise the kayak framework might creak, which would be easily heard by a seal.” (Petersen 1986, page 28). Zooming in on my photo of Heath’s completed kayak at Uummannaq town, you can again see how very slightly the fore deck beam closest to the masik is curved. Still on the subject of the seeqqortarfik, Petersen describes it as being separated from the masik by only 1 to 1 1/2 fingers’ width. In this image that’s the masik (vertical on the page) at the extreme right with the seeqqortarfik close beside it. This is also the case for some examples in Golden’s KoG. From his scale drawings of four kayak frames (#25, #50, #51, and #71) and of “amidships framing layouts” (for #9, #14, #26, and #66), and also from his text and sketches, we have information on the size of the gap between the seeqqortarfik and the masik for ten of the West Greenland kayaks in his KoG. In each case, the gap appears to be less than three inches. In four cases (#33, #50, #56, and #71) there is essentially no gap at all. In Uummannaq Bay (and there was an interesting discussion of this on QajaqUSA.org, back in 2003 and 2004), the position of this deck beam was different from other kayaks of the west coast. In the Uummannaq Bay kayaks, the masik alone gave a firm hold on your thighs when you “gripped” the kayak by upwards pressure of your legs. Rather than being separated by just 1 to 1 ½ fingers’ width, the first deck beam in front of the masik was positioned to be just in front of your knee caps. Greg Stamer’s photo of that part of Heath’s kayak shows this well. So much for the 1959 kayaks. now let’s take a look at the earlier examples. Another look at the 1896 Goodnow kayak. That same sheer line curve, that same rising bow and raked stern. Alfred Bertelsen’s photo from 1902 showing two kayaks off shore at Niaqornat. You can see the characteristic curve of the sheer line and the rising bow and raked stern features. Rockwell Kent’s Illorsuit kayak from the early 1930s. It has the same sheer line curvature, with rising bow and moderately raked stern. First, Drever’s just completed kayak, in 1938, with Knud Nielsen who made it. The second photo shows it while still being built (it’s upside down in the photo). The outward lean of the gunwales and the smooth curve of the sheer line already showing up beautifully. Well, that’s a lot of looking through the photos and comparing what they show with certain of the different designs shown in Golden’s KoG. I’m convinced, and I hope you agree, both that there was such a thing as an Uummannaq Bay kayak design and that we can recognize it all the way from the 1896 Goodnow kayak, thru the 1902 kayaks at Niaqornat, Kent’s and Drever’s Illorsuit kayaks from the 1930s, and on to the many kayaks that I saw and tried out and measured and photographed in 1959. 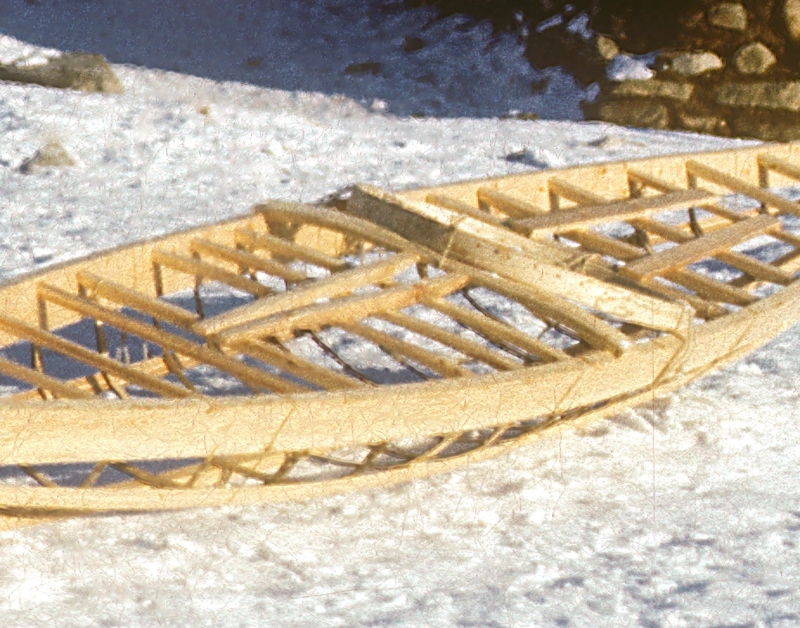 All in all, compared with other design types found elsewhere in Greenland and known from museum specimens of many years past, the Uummannaq Bay kayaks of 1959 could be said to have an essentially simple, a very basic design. As well as the noticeable sheer, very low fore deck and slightly raked stern piece, they do have one quite distinctive feature – the fore deck beam closest to the masik is positioned to be in front of your knee caps. Everything that I’ve said so far has been about the similarity of all the Uummannaq Bay kayaks I saw. As I drafted it at one point: “they all seemed to be made from the same mold.” But there was one quite significant way in which they did vary — in the cross-sectional shape of their hulls. Depending on how its ribs are shaped and whether or not the side stringers are set on the ribs so as to be on the same plane as the outside surfaces of the gunwales, a kayak will be what’s called “hard-chine” or “multi-chine.” And this is not just an aesthetic difference, not just a difference in “what they look like.” This is a difference that affected their actual handling, their very performance as hunting kayaks. Golden discusses changes in the cross-sectional shape of kayak designs in his analysis of the emergence of the seven West Greenland kayak types (KoG, pages 530-543). Here (as he does too) I am talking about the simultaneous use of both hard-chine and multi-chine kayaks in one area at one time. It’s fascinating to me that while Emanuele had made my kayak to be hard-chine, just a few days later he made Heath’s multi-chine. This taken from Duncan Winning’s scale drawing. It shows how the kayak has flat or “slab” sides and a shallow “vee” bottom. What’s known as a “hard-chine” cross-section. This is taken from Harvey Golden’s scale drawing of Heath’s kayak (plate 72b on page 315 of his KoG). With the two side stringers set closer to the central keelson, in Heath’s kayak the lower edges of the gunwales “protrude” to give each side two facets (and not a “slab” shape) plus a bit less of a shallow “vee” bottom. What’s known as a “multi-chine” cross-section. In his discussion of these two options, H. C. Petersen comments that the multi-chine hull gives a less stable and “more difficult to balance” kayak (having less initial stability). Arnarulunguaq [John] Pedersen of Ilulissat, Greenland, in an email in which he kindly replied to questions of mine, told me that a hard-chine kayak will have better directional stability (which is desirable, of course, for using guns in seal hunting) while a multi-chine kayak, on the other hand, will be less (directionally) stable but easier to turn and maneuver with. As H. C. Petersen also says, building it to be hard- or multi-chine “is normally determined individually from kayak to kayak” (2001, page 44). The six “mixed” kayaks have the, obviously rare, characteristic of being hard-chined at one end and multi-chined at the other. In 1959, when the kayaks were in use, the waterline was just above the lower edge of the gunwale. So you couldn’t see if a kayak was hard-chine or multi-chine when it was in the water — it needed to be out of the water on its rack or being carried. And, of course, most of my photos of kayaks are of when they’re in use. Golden’s Type VI kayaks then, more of them are multi-chine (13) than hard-chine (5) and, sure enough, from a careful look at those of my photos which show the hull shape of the Illorsuit and other Uummannaq Bay kayaks I’d say that many, but not all of them, were multi-chine. Enoch’s kayak at the Karrats campsite as he carries it to the water for his second hunt of that day. You can see that it has the multi-chine shape, especially from below the line tray back towards the stern. Another view of that “classic” example. You can see that at the lower edge of the gunwale the skin cover is actually abraded — clearly a multi-chine kayak. Edvard’s and my kayaks on the motor boat at the Karrats campsite. By zooming in a bit we can see that Edvard’s was a (slab sided) hard-chine kayak. One of the Uummannaq town kayaks, a good example of a slab sided hard-chine kayak. As to why mine was hard-chine and Heath’s multi-chine, why some men’s kayaks were hard-chine and others multi-chine — that was never explained to me in 1959. As I read him, Petersen is speaking of hard-chine kayaks when he says: “in a flat-bottomed kayak the ribs have a marked curve at the sides with an almost completely flat middle section. … A broad and flat-bottomed kayak … does not tilt over easily so it is good for beginners and for less able kayakers.” And, a bit further on: “Some kayaks are designed with a special bend in the sides which stabilizes the kayak and prevents it from capsizing too easily. It is mostly built for beginners and for men who have not mastered the art of balancing in a kayak” (1986, pages 45, 46).